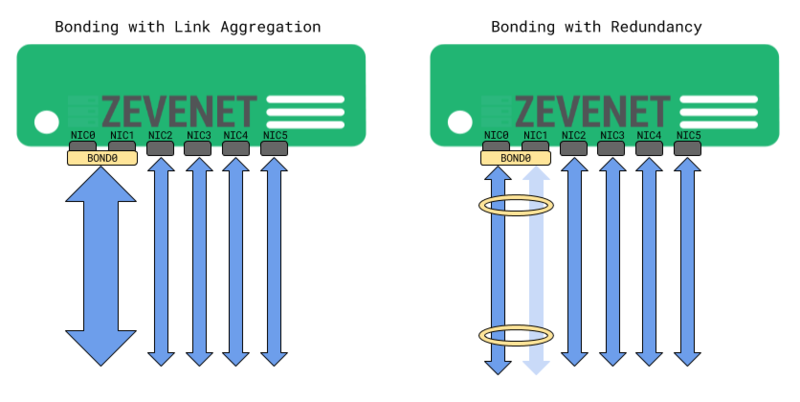 Bonding interfaces (also known as link bundling, port trunking, channel bonding, link aggregation, NIC teaming among others) permits to join several physical network interfaces to work as one logical network interface. This kind of interfaces are able to provide an aggregation or addition of throughput of several NICs, load balancing between them at NIC layer and redundancy allowing failover between those NICs that builds the bonding. See below an example of two different use cases of bonding configurations. This section describes how to configure and operate with bonding interfaces. This table lists all the bonding network interfaces configured in the system. NAME. System name for the bonding interface. ADDRESS. IP address assigned to a given interface. MAC. MAC address that is assigned to a certain bonding. NETMASK. Network mask assigned to the bonding. GATEWAY. Default gateway used by the bonding. STATUS. The status of a given bonding, the available values are Green if the bonding is up and Red if the bonding is down. Create interface. A new bonding interface needs to be created. Delete. Unset the configuration and remove the Bonding interface. The bonding interface will be disappeared and the slaves interfaces will be available again. Edit. Change the interface configuration like IP address, netmask and gateway. Unset. Remove the interface configuration. The actions will be executed in batches in all the selected bondings through the multiple selection option.